blog.samseidel.org: Scooby Doo where are you? In Stockbridge, MA -- no kidding! Scooby Doo where are you? In Stockbridge, MA -- no kidding! After a rough 2016, the new year kicks off with hope for better days and unseasonably mild weather in the Massachusetts. It's time to look on the bright side. There are many wonderful things happening in the Bay State right now. Chief among them is a show at the Norman Rockwell Museum, "The Architects of Saturday Morning." 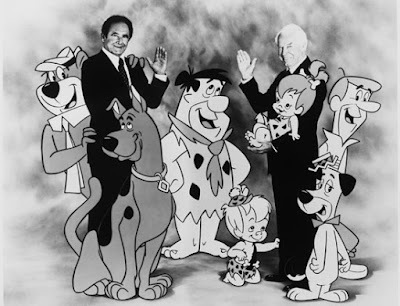 The marvelous cartoon genius of Hanna-Barbera, the creators of The Flintstones, Yogi Bear, The Jetsons, Scooby Doo and many other Saturday morning treats is on display at the Stockbridge, MA institution, and what a treat it will be. For kids of the 1960s, '70s and '80s, Saturday mornings were a world filled with lovable characters and mad hijinx. People of my generation spent hours in front of television sets watching cartoons. Sure, maybe our screen time was a little excessive but with their antics firmly etched in our minds, these adorable types will live in our generation's collective memory forever. A trip out to Stockbridge offers the chance to revisit them and to reflect on the imagination that was William Hanna and Joseph Barbera. Hanna-Barbera: The Architects of Saturday Morning runs through May 29, 2017.